Feels a bit strange to write a vacation ride days after it happened instead of tapping out the pre-post with it fresh in my mind, but here goes! Saturday night, my little Apple started having issues. It kept going into sleep mode and wouldn’t wake. Talk about frustration. I was worried I’d lost not only the two blog posts I’d written, but also a chapter or two of something else. Because of it, I got to bed even earlier than on the previous two nights. I woke at 3 am and hurt. My back, shoulders and legs were all a tight mass of muscle aches and the bed which had been comfortable the first two nights seemed to aggravate it. I wasn’t going to wake Jens before 6 am though. Yes, that’s right. I planned to leave the furball with the hubby. Don’t get me wrong, he’d done incredibly well on the previous two runs. Best he’s done all year both in speed and distance. I didn’t want to leave him, but he seemed to need rest and I wanted the skin on his paws to recover. Like the day before, the socks would be a problem because of rain. I didn’t think his feet could take many more miles sockless. In truth, I think I really needed a rest as well, but it was the last day. The last chance to see more of the Klarälvsbanan I had become so enchanted with. Not even the rain would stop me from doing a few more miles. Around 8 am, we were at the church and I was unloading the trike. Jens walked around with the fuzzy. He was moving fine, but lacked the insane, go-in-circles, heights of energy. Even so, when Jens came back as I settled the last items, Loke came directly to his running bar and wagged his tail. How is that for determination? According to Jens, he was quite forlorn as they drove off and I headed for the Klarälvsbanan. Loke has been at my side for almost 100% of my cycling in the past 2.5 years, so it felt very strange to be alone. I kept groping for the leash and looking over to see how he was doing. I called out ‘Höger’ and ‘Vänster’ when I made turns. I’m not sure, but I might have even smiled less. Patches of sunshine gleamed through the clouds as made may way through Munkfors. As I adjusted to the reality of being solo, I tried to keep my pace in mind. Loke usually stops me from wrecking my knees so I made certain I didn’t push the pedals any harder than I do when he’s with me. It was difficult though. All through Munkfors, car barriers stood across the path where it met roads. Generally they’re a nightmare, but for once, these were sensible. Each were staggered. Meaning the two weren’t directly across from each other, but one would be set back 4 feet and both rotated. It was the perfect combination. I could swerve a little to miss the left one and then push the right away to pass. Why can’t all barriers on cycle paths be made like that? I’ve come across some that were a 5 minute nightmare for me to get through. Leaving Munkfors behind for the countryside, I moved in and out of the sun. The air was cool, but not cold. I had my windbreaker thermal pants on, but no extra layer for my top which was the perfect balance between ambient temperature and exertion. My cruising speed at 1% – 2% grades was roughly 10 mph, pretty good for me really. On flats I actually kicked the chain up into the big ring to rip along at 16 or 17 mph. It’s been ages since I’ve used the 52 off the trainer. The speed was addictive though not enough to stop me from missing the fuzzy one. Mile 7, I reluctantly left the path, dreading what I knew must come. A church waited for me across the river and the certainty it meant hills filled me. How right I was. The miles I’d already crossed proved how tired the previous two days of riding had left me though it hadn’t slowed me down much. I could feel every foot of the mild 3% grades of the cycle path I’d done and they had been harder without Loke to give me the occasional boost he offers when he decides we’re going too slow. The streets through the little residential area weren’t too bad. People out working in their yards gave me friendly greetings as I passed as well as a pair of cyclists. In minutes, I was perched at the top of a hill and looking down at the bridge and river below. It was a solid 8% grade or better though the other side looked less steep and shorter. The road was wet with rain which had passed through, missing me by minutes from the look of it. After sitting for a minute or 3, debating how badly I wanted a picture of that church, I finally took the plunge. Talk about a rush. I hit 25+ mph which feels more like 100 mph when you’re sitting so low to the ground. I chickened out and used the brakes to keep from going faster since the water on the road surface made it hard to tell the condition. It would have meant very bad things to hit a pot hole at 30 mph and I’m not sure at what speeds a trike will hydroplane. The brief view of the river as I flashed across the bridge looked pretty, but I didn’t stop for photos. I wanted as much momentum I could get to carry me up the other side as far as possible. Once gravity overcame inertia and I had to work up the rest of the way, I spotted a cycle path. I didn’t risk it which was a good thing. It was unpaved steep drop into a ravine and then a nasty, unpaved climb back out. It would have killed me at the best of times I think. My right knee felt a little odd, but I made it to Ransäter’s Church. It’s amazing how regional churches can be and how just a few miles can radically change appearances. 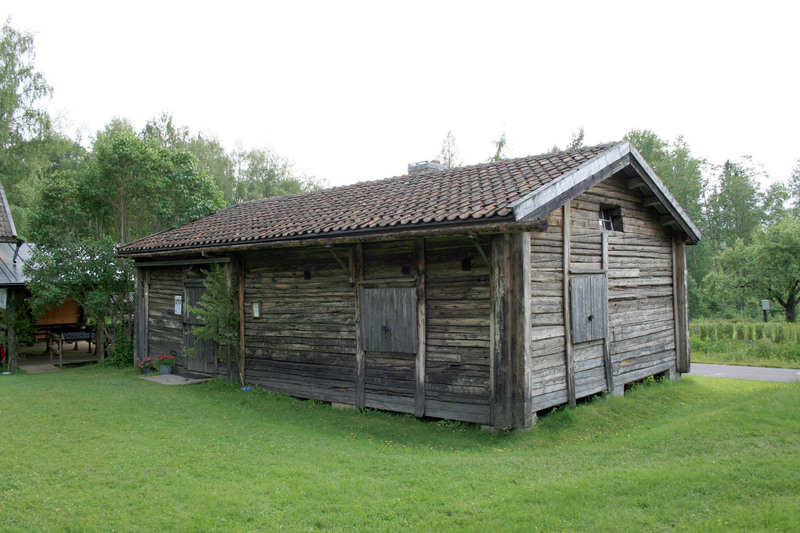 From Ekshärad and north, the churches had the distinctive wood shingled sides. From Hagfors south, they took on another appearance with Munkfors being somewhat the odd for the area. Church collected, I turned back to face the bridge crossing once more. It was even harder, but slow and steady made it up. I felt good to coast back through the residential streets and return to the cycle path. The 10 to 17 mph pace continued on the path. Forest, fields and tiny summer cottages lacking power or running water continued to zip by. Occasionally, I passed a house or farm stead. A few of them had set up little kiosks selling ice cream and drinks to those on the Klarälvsbanan. There were more of the signs at cross-roads indicating cafes and cultural sights, but as on the day before, I continued by them since they never offered distances. The two women who had greeted me as I left the path for the church reappeared from the south with big grins and waves. I rarely stopped, preferring to gulp water on the go. Eating was a non-issue. As usual, I didn’t want and didn’t seem to need food. I often wonder if my performance would improve if I actually did take in a few mouthfuls of nuts and granola every hour, but once the wheels and pedals start turning I forget. One stop I made was to take a picture of the cycle path’s previous life as a rail road. 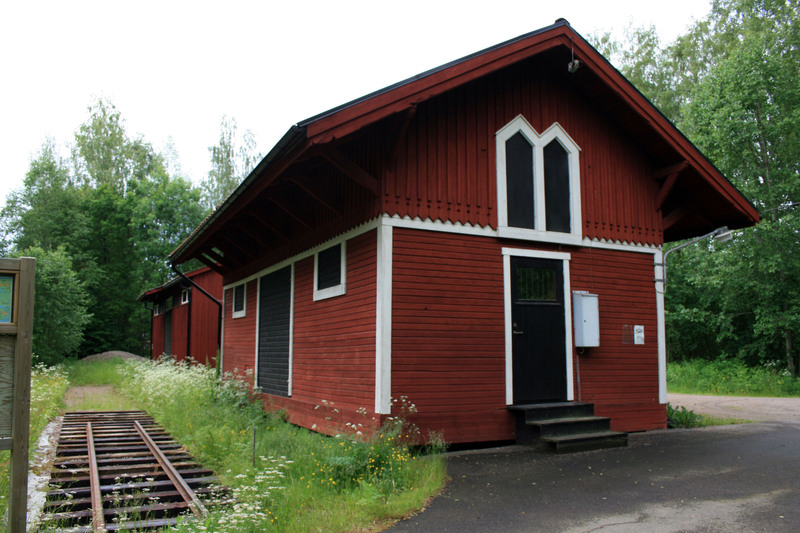 This little train station appealed to me much more than the one in Munkfors. The clouds had been thickening for more than an hour, but luck stayed with me. Every now and then, I felt a single drop, but the real rain missed me. I kept telling myself it wouldn’t last. Around mile 11, I made a longer stop when I found a collection of buildings. A sign announced it was a cafe and an old smithy. During most week days during the summer, it was open for interior viewing. Sundays were the exception. Still, I collected my camera and walked my way up the grassy hill from one building to another. I wondered how much further my ride would be as my legs wobbled with every step. Returning to the trike, I had the feeling my fortune with the rain would soon change. Unbroken and dense, the clouds made it obvious. After a few more glances skyward, I looked at maps to check for a near by church. Nothing plotted on the printouts, I double checked my map book to discover a there was one in the area. Why I hadn’t added it to the route, I was uncertain. The turn for it was less than 50 yards past the little cafe so it was good I did look. The road to and from the church was fun! There were hills, but they didn’t seem so challenging. Enough of it was downhill from both directions I felt a bit like I was in a car race. I sped along at 20+ mph and whipped around curves without worrying my sudden direction changes were going body slam Loke or yank him off his feet. The people in the area were very friendly too. Lots of waves, particular from those in cars. Instead of the usual raised hand and nod, the people who went by had huge grins and waved enthusiastically. Some even leaned toward the windows as if wanting to be absolutely sure I saw them and waved back. The wind rose as I climbed a hill toward Över Ulleruds Kyrka (Upper Ullerud’s Church). It hurried me along as I crossed the church yard for a good view of the church for the camera. I’m not sure why I rushed. It wasn’t like the trike was going to shelter me from the rain. I did have my umbrella, but it would mean sitting and waiting the rain out. A waste of my limited time. The first big drops hit me as I sat down in my seat again. I hurried to the temporary shelter of a tree as the weather showed me it meant business this time. I stayed there only long enough to make certain the weather cover was secure on the camera bag and my iPhone was safe. Then I moved out. The moderately heavy rain was chilly, but not as cold as I expected. At least I didn’t have half frozen drops freezing to my legs. The wind as I sped down hills blew water back in my face, but I only smiled. The climb back up to the intersection of the road and cycle path took me a while. A man and woman watched me from the shelter of their car port. Much to my surprise, they called out an invitation to join them until the rain passed. I waved and thanked them, adding I couldn’t get any wetter so I’d keep on. They laughed. The offer was very kind and made me feel all warm and fuzzy beneath the soggy weight of my skin. The sky darkened as I cycled through a corridor of trees under a ceiling of heavy gray. Then the bottom really fell out. Water streamed from the sky in a torrent impressing even this southern girl. I grew up with violent summer storms that could drop inches of water in record time. This almost matched them. Still rolling along at 10-14 mph, I tucked my chin down in an effort to keep it out of my face, but it fell so heavy it splashed off my shoulders and upper chest into my eyes. It reminded me of the scene in Forrest Gump where he talked about the rain in Vietnam. It came from above, it came from the side. It even fell up. It should have been miserable. Instead, I laughed and giggled and grinned as I slogged on. I waved cheerily to a bike rider and a man on roller skis. They didn’t look nearly as giddy as I felt. It must have been more than 2 miles through that sky-born waterfall, around 5 miles of rain since leaving Över Ullreds. Coming out of it was like stepping through a door. One moment I was pounded by water, the next I coasted through bright sunshine with not a sprinkle. I stopped to give things a thorough check and take a picture of the direction I’d come from. I must have been a sight for the group of 4 who came from the north. Water still ran, not dripped, off my cap, helmet and clothes as I stood in the bright sun. It must have looked like a fire-fighting helicopter had dumped on me just seconds before they saw me. They gave wary looks between me and the steely blue-gray clouds behind my trike. One of them asked how bad it was. I grinned and told them it was like going through a car wash. Hardly comforting, but the truth. Certain nothing was ruined from the unexpected pounding, I went on. Though the storm had passed, it didn’t take the brisker winds with it and those were cold. I pulled on my bright yellow jacket, but it had gotten soaked through the panniers so wasn’t much of a help. It definitely made me pedal faster to keep warm. I soon arrived in Deje as another wave of rain arrived. It lacked the intensity of the previous, but still kept me soggy. I’d started the ride tired from the previous 46 miles over two days. After pushing so hard through the rain and low grade hills, I was starting to feel exhausted. Jens had planned to hangout in the Forshaga area to check fishing places as I came south. That was less than 7 miles from Deje so I was determined to make it at least that far. I departed from the cycle path once more to find a church. It didn’t last long though. Less than 100 yards from the Klarälvsbanan, I stopped at a steep down and up. The way to the church led through a rather intense industrial area, probably even more hills than the one making me hesitate and a quick look on my GPS showed it would add a mile each way. A twinge in my knee turned me back to the trail. It wasn’t worth it. No runestones and I already knew the church looked a lot like Över Ullreds Chruch. Immediately south of Deje, the trail went through a pretty forested area against the steep western shore of a lake. My pace picked up sheltered from the wind as I was. The showers still dripped through the trees so I didn’t want to risk water getting to the camera. One of the few dry moments I had came while passing through a deep cut in a hill. Not climbing it was wonderful! No less than 5 road cyclists passed me, low on their bars and pedaling like Lance Armstrong himself came hot on their heels. If any of them was slower than 25 mph, I’d be surprised. Almost felt embarrassed with my meager 15 mph. Still all of them gave me nods and two even offered big smiles and thumbs-up. I even passed a cycle-tourer! His bike was fully kitted with rear panniers and a Burley cargo trailer. His trailer’s cover was blue instead of day glow yellow, but otherwise identical. He didn’t so much as nod when I waved. Ah well. He might have just been tired and miserable at the weather. The passing showers seemed to have passed by the time I came to Forshaga. The trail went straight through the middle of the town about twice the size of Deje. Missing Forshaga church would have taken effort. It was one of the more interesting churches of the day. I especially liked the ivy covered wall. I called Jens to let him know I’d arrived in the town. He would be a while in coming since he had just ordered lunch and would want to eat it. He was okay with picking me up a little further along if that was what I wanted. With the choice of sitting in the church parking lot and shivering in the wind, or riding on to keep a little warmer by pedaling, I went with the latter. I asked if he was really okay with it. Not just saying it to make me happy while going out of his mind with boredom. He assured me he was cool with just puttering around. He had changed his mind on the 5 pm limit to head home though. He would like to have me packed up and all of us on the road around 2:00 pm. I was more than okay with that, tired as I was. As I left Forshaga, I soon wondered if I’d made the right decision. My knees were starting to bother me and my legs lacked strength. Then I saw a sign. 20 km to Karlstad. 20?? That was only 12 miles. I paused to stare at that number. My average speed on the trail had been close to 11 mph. Potentially, I could reach Karlstad in less than 2 hours which would be within the adjusted time span. Karlstad and the end of the Klarävlsbanan. The idea of reaching the end of something pulled hard at me. It might not have been a preset goal, but what’s wrong with spontaneous ones? I could potentially accomplish a impulsive challenge and finish the trail. I hate admitting it, but I am weary of constantly falling short on the things I set out to do on the trike. A tour cut short. Failing to reach mileage goals pains me even when it’s because of injury (mine and Loke’s). I saw the opportunity to tip the balance toward the positive, even if just a little bit. I could feel my face set into a grim expression as I clipped back in and set out, tired legs and aching knees or not. I’d like to say I flew. It’s not entirely true. There were long hills, some went on for a mile or more. It seemed every time I had to climb one, a 20 mph wind came blasting into my face. That made me creep even on the 3% grades, though ‘creeping’ now meant 7-9 mph, not 2 mph. I hated that wind. It felt like it had appeared as soon as I accepted the challenge to reach Karlstad and it was determined to foil me. My brain screamed silent curses as it as I panted through gritted teeth and forced my legs to keep spinning. It was during one of those tortuous, windy climbs when a couple passed me. I recognized them as they said, ‘Hej’. I had seen them the day before at the rest-stop just outside of Uddeholm where the Klarälvsbanan began. It seemed they were also riding the length of it. It surprised me they hadn’t ridden farther than I. After all, I’d stopped at Munkfors around 2 pm the day before. They were doing perhaps 9 mph compared to my 7 mph. As I battled on, I watched the woman shifting uncomfortably on her bike. She stood on the pedals for a bit, then would sit down to knuckle her back or shake out her hands. I remember when I used to do that. It consoled me that all I had to do now was pedal rather than worry about bike discomfort. They were about 1/8 of a mile ahead when I reached the top of the gentle hill and the balance of power shifted. Even into the wind, at grades between 0% or 1% I could hit and sustain 14 mph. I shot past them and soon they disappeared around a subtle curve. I didn’t really feel much accomplishment about skunking them though. That came a few miles later while climbing a 1% grade. I kept a close eye on my rear view mirror because as long as there was no one to hear, I was yelling my curses at the wind. Then I saw him. A 40-something year old guy fully decked in roadie gear and low in the bars as he pedaled furiously. I bit my tongue, expecting him to blast past me. A couple minutes passed and nothing. I looked in the mirror again to see him still back there. A little closer, maybe but only by about 10 yards. He stayed well back for almost 5 minutes. Then the grade sharpened to 3% and my speed dropped to about 9 mph where he finally overtook me. He was red-faced with a determined scowl when he passed with barely a side glance. He looked pretty fit and I wonder if he was mortified to see that the engine in the weird looking bike he was only now able to pass was an overweight, gray-haired woman. His cadence slowed a little only when a couple hundred yards separated us. About then the slope eased to 1% and my speed jumped again. Both of us on a 0 to 1% slope with a 20-22 mph wind in our faces and I edged forward. He finally threw a glance under his shoulder. The smug expression disappeared with a widening of his eyes. He stood on the pedals and hammered on them, fighting to hold the lead. On my part, I made no more effort than I’d been making before he appeared in my mirror. I still had miles to go and who knew how many more climbs while fighting the weather and wet clothes. I wonder if I could have overtaken him if I’d put in the effort. I have no regrets for not doing so. I would have felt much worse if I’d tried and bonked out before the end. Finally the terrain favored him again and he slowly pulled out of sight. It seems I made him work for it. Who wouldda thought I could make a seemingly fit man on a decent road-bike struggle without even attempting to race him? My maps were forgotten in the ride south from Forshaga. 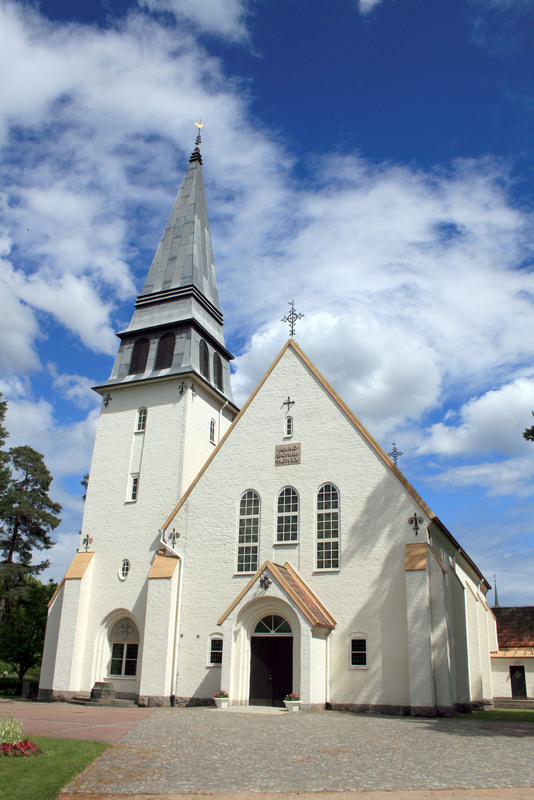 There had been a church I’d planned to collect between Forshaga and Karlstad, but it would have meant adding 8 miles which would have taken too much time. Not to mention the effort. Steeper hills and that much more distance? I’m not sure I could have made it even if Jens hadn’t changed our departure for home time from 5 pm to 2 pm. I only remember stopping once after leaving Forshaga. I called Jens to tell him I was 5 km (3 miles) outside of Karlstad. I was reaching the wall. I felt it in my screaming, cramping muscles and agonized knees. I panted desperately to get enough oxygen to my limbs. It was only 3 miles left. The basic River Loop at home is barely 3 miles. I told myself I could do that in my sleep on my worst day. I found a little scrap of strength from somewhere. My mind wandered as my exhausted legs seemed to be on automatic. One thing puzzled me, was my knees. Why did they hurt? It was the worst I could remember in a while. I wasn’t pedaling any harder than when Loke was with me, I was making darn sure of that. The answer drifted out of the back of my tired brain. I wasn’t pedaling harder but I was pedaling more. Except the few times I’d been flying down hills at 25 mph or more, I’d been pedaling. The time spent coasting was nearly non-existent. Not so when I’ve got the furry one with me, particularly when he’s pulling a little. I do pedal, but I spend about 1/3 to nearly half the time simply rolling. He sets the speed and I try to maintain, get up hills and avoid dragging him when conditions favor the trike’s forward momentum without my help. The difference between having him with me and going solo felt comparable to the contrast between a brisk walk and a flat out run. Before I knew it, I clenched the brakes to stare dazedly at the sign which was a close twin to the one I’d passed under the day before. I went limp in the seat and gasped for air the way a beached fish does for water. My hands shook as I took an iPhone photo to share the triumph with my friends and family on FB. They weren’t any steadier with the camera. The last little bit of my energy rolled me under the sign to a tree near the parking lot for the lake-shore park. I called Jens to give him the coordinates before staggering to the picnic table. It felt wonderful to sit on something that didn’t move. 41.33 miles. I’d started from Munkfors after 8 am and finished in Karlstad about 2:30. Accounting for time at churches, map reading, bathroom breaks, exploring the smithy site and old train station, I spent only a bit more than 4 hours rolling. Roughly a 10 mph hour average. I haven’t ridden that far in one go in two years or more. Not since Loke and I did 43 miles from the far side of Sala to Forsby. For the entire long weekend vacation I covered 87.69 miles. That is just short a third of the year’s total I began with! From a YTD mileage of 281 to 361. It had felt strange to go solo, but I never would have been able to do it in the time allotted if Loke had been with me even if he hadn’t already covered 46 miles during Friday and Saturday. And best of all, I saw a goal to the end.